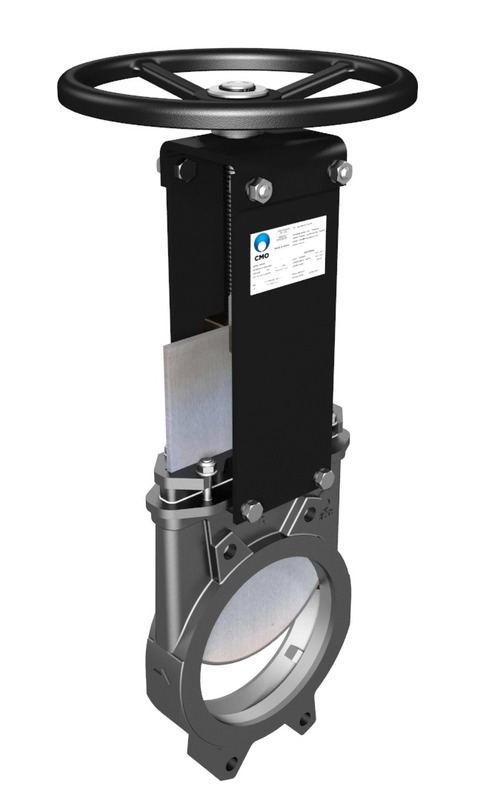 Knife Gate Valve - CMO Valves - Manufacturing the valve you need. Unidirectional wafer design valve. One piece cast body with guides to support gate and seat wedges. Provides high flow rates with low pressure drop and include various seat and packing materials available. Face to face dimension in accordance with CMO standard. An arrow is marked on the body indicating the flow direction. This knife gate valve is suitable for liquids that contain a maximum of 5% suspended solids. If it is used for dry solids in gravity feed applications it should be installed with the arrow on the body pointing in the opposite direction to the flow. When a knife gate valve remains open for long periods of time and the body’s internal walls are parallel a very large torque is required to close it. Model A’s body is cone-shaped inside, providing greater space. When the valve is closed the solids stored inside it can be easily removed. The valve is defined as unidirectional and these valves are normally at risk of the gate bending due to counter-pressure. Stem protection hood is independent from the handwheel securing nut, this means the hood can be disassembled without the need to release the handwheel. This advantage allows regular maintenance operations to be performed, such as lubricating the stem. Stem on the CMO valve is made of 18/8 stainless steel. Another added advantage, as some manufacturers produce it with 13% chrome and it gets rusty very quickly. Handwheel is made of GJS 500 nodular cast iron. Some manufacturers produce them in normal cast iron which can lead to breakages in the event of very high operating torque or knocks. Paper Industry, Mining, Silo emptying, Chemical plants, Bumping Food, Industry Sewage treatment.